Are you lost in a sea of technical indicators? 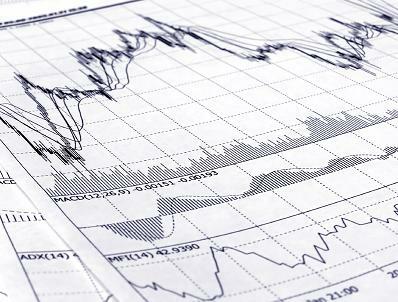 Technical indicators are derived from the open, high, low, close and volume data generated by the stock market. Manipulation of this data provides a number of indicators which stock traders place on their stock charts to provide them more information. In many cases, traders who have just purchased a computer with stock charting software dump all of the technical indicators they know of on the chart and when they all say buy, they buy. If this is your plan, you might want to rethink it. Multiple technical indicators give you multiple signals so you end up just as confused as when there were no indicators on your chart. A few well-chosen technical indicators will be a lot more valuable to you that lots of poorly chosen indicators. The type of indicators you use will depend on the type of trading you want to do. For example, people who are trading new high breakouts would likely use different indicators than people who want to trade oversold markets. 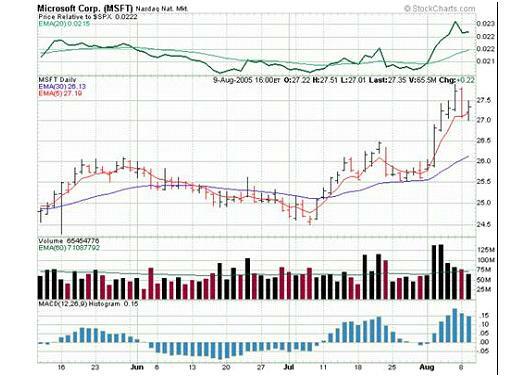 Let's take a three month daily graph of Microsoft (MSFT) and add a few indicators. Doesn’t the stock chart look a lot different and far more confusing? There are multiple signals and different people learn to use these signals in different ways. The green line on top is comparing the strength of MSFT to the Standards and Poors 500 Index (SPX). When the thick green line is above the thin line MSFT is outperforming the SPX index. On top of the price movements are now two exponential moving averages. In this example, the long average is 30 days while the short average is 5 days. A common technique is to buy when the short EMA crosses above the long EMA. Sometimes this works great while other times the number of false signals is so great, you will lose all of your capital just buying and selling. The black and red lines are volume. For this graph, the volume in red occurs when the close is lower than the open while the black lines result when the close is higher than the open. The Moving Average Convergence and Divergence (MACD) histogram is shown at the bottom of the graph and represented by the blue vertical bars. The MACD measures the differences between two moving averages. As an example, some people use this indicator to measure a divergence between the stock price and the indicator. For instance, the stock hit a low in early July while the MACD histogram hit a low in mid-June. Thus some people might consider the stock is stronger in mid-July even though it is making a new low. There are many books on indicators but before you start using them, you should understand them. Most of the books in our technical analysis book review section contain some information on technical indicators.